There aren't enough food, service, value or atmosphere ratings for Hong Tin, United Kingdom yet. Be one of the first to write a review! Had a take away for two from here last week. 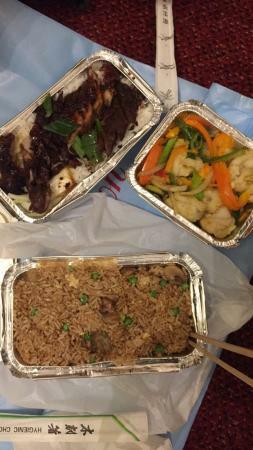 The best Chinese take away I have ever had. Amongst the food we had were ribs so tender that when lifted from the container the meat literally fell off the bone! Highly recommend. I’m a frequently costumer, the food is very nice The place is clean and the staff is friendly The spicy prawns and spicy calamari are my favourite! mushroom fried rice was so amazing! Other menu were also nice. And stuff’s smile was lovely! Good taste,nice value, short waiting time..I would love to visit there when I get to Hammersmith next time definitely! ARIGATO! We visit the Hong Tin a couple of times a month. The menu is extensive, the service efficient and the staff friendly. This is a takeaway outlet only. No seating. this was just in front of my hotel and we where very supersized to order a full 4 person meal in very good quality and very reasonable price. Tasty and great !!! Get quick answers from Hong Tin staff and past visitors.